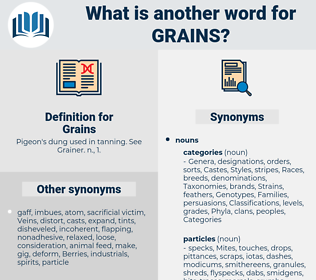 What is another word for Grains? earnings, Grasses, Gains, feedingstuffs, cornflakes, grams, Seedlings, Commodities, foodstuffs, Oats, winnings, Elevators, rations, PARTICULATES, crops, bins, eggs, grounds, increase, increases, wheaties, Powders, Membranes, producers, Oils, efficiencies, upwards, TONNES, Legumes, Movements, beads, Plants, days, Cultures, stovepipes, Prices, flakes, pieces, rises, Tablets, seeded, employees, squalls, Pulses, pills, cars, bucks, specks. Grapes, granules, Distilleries, distillers, particles, silos, crackers, pellets, Berries, Beans. Just ahead of him in line was a young man in an obviously new suit; the pretty girl holding to his arm still had a few grains of rice shining in her hair. And yet - could they but know it, as the sands run down in the hour - glass of time there are golden grains gathering still to drop into the lives of each. 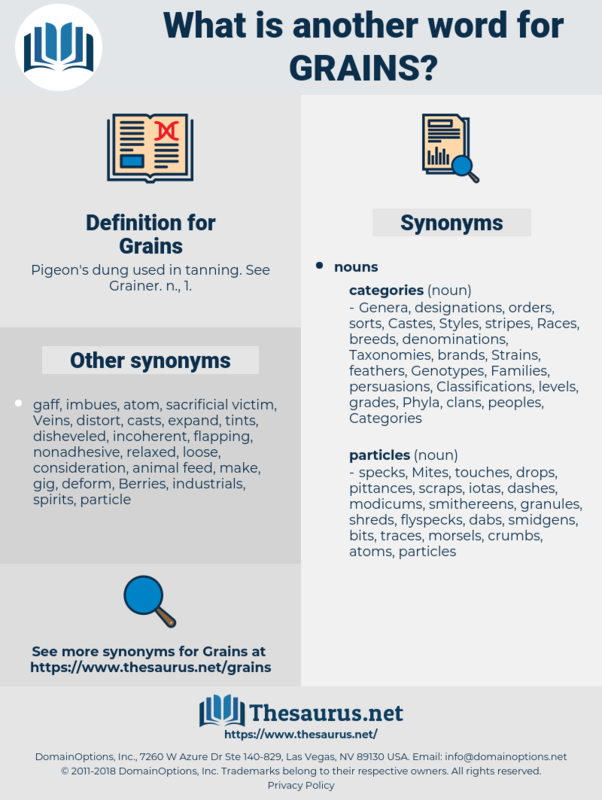 geronimo, germane, gran, germanium, groin, giriama, green onion, grin, groom, gurney, germy, gramme, groyne, grainy, grim, grime, gagarin, greeneye, guarani, grahame, grannie, gray hen, geryon, greene, greenway, Gramineae, greyhen, grown, graham, grimy, garonne, gramma, germ, granny, germany, grama, german, Grume, gram, grey hen, grimm, green, groan, grayhen, geranium.